This is an exciting day for my blog, as I am pleased to have my very first guest post! And, what makes this so special to me is one of my dearest friends, Cyndee Ownbey, from the Women’s Ministry Toolbox, is my special guest! We are kindred spirits who love women’s ministry and desire to help other women’s ministry leaders in our churches. 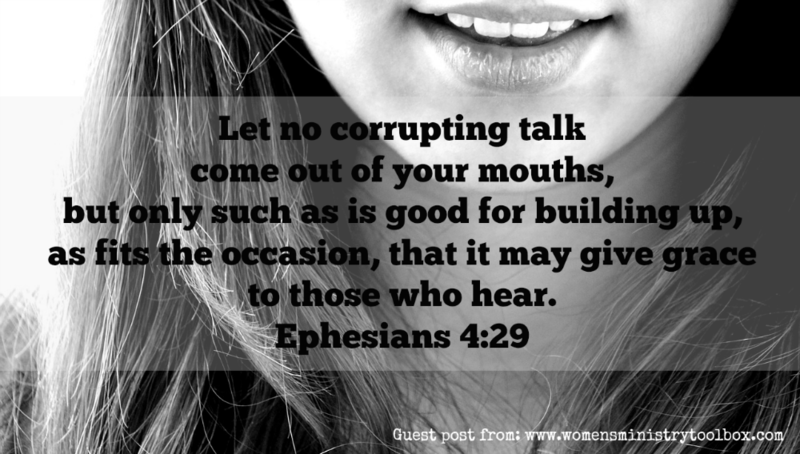 She has a very much needed word for us today, so read on! I was spoiled. Really spoiled, but didn’t know it. I’ve had the joy and honor to serve as Women’s Ministry Director in two different churches in two different states. There were several things that were “stamped yes” in my first church that were not in my second church. Admittedly, I made some assumptions that I shouldn’t have. At my first church my Pastor of Education rarely told our team no. We may have gotten re-directed or had to scale back our big plans a bit, but for the most part the ideas and plans we brought forward were green-lighted. God had new lessons for me to learn at the second church. Not only did I have to earn my stripes as a newer church member, but many of our requests were met with a “no”. To say that was very hard for me is a bit of an understatement. I don’t like to be told no. I was frustrated. I got mad. I couldn’t understand how our team’s plans, covered in prayer, could not move forward. So what’s a girl to do when her Pastor tells her and the Women’s Ministry Team “no”? Trust God is in control. This is hard when you’ve prayed and you are confident it is God’s will. If God wants it to happen, it will in His timing. See Romans 8:28, Jeremiah 29:11, and Isaiah 55:8-11. Submit to the authority under which God has placed you. See Hebrews 13:17. Preserve the unity in the church. As tempting as it may be, you must not return to your team and complain about the response you received. Talking badly about anyone on the church staff will create division. Take your concerns to the throne. See 1 Corinthians 1:10-13 and Ephesians 4. I’m not saying this is going to be easy. It’s not. You can stand your ground, throw a tantrum, or do it anyway, none of which honor God or the role He has placed you in. 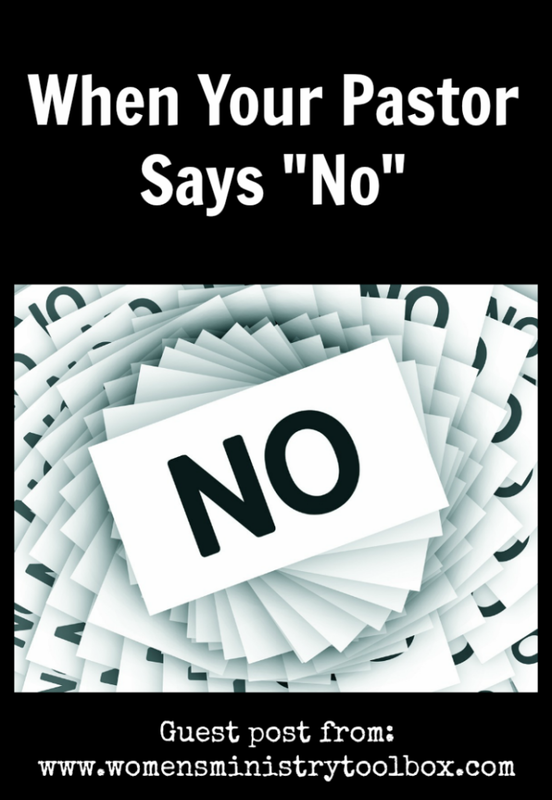 Determine now what your response will be the next time your Pastor tells you and your team “no”. A gentle, submissive response can impact the response to future requests your team submits. Keep your eyes fixed on Jesus and remember that a “no” can often be a blessing in disguise. Cyndee Ownbey blogs over at WomensMinistryToolbox.com and is passionate about helping other Women’s Ministry Leaders reach and encourage women in their church and community. 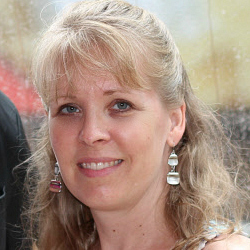 She and her husband, two sons (12 and 15), and miniature schnauzer, Heidi, recently relocated to the Charlotte, NC. When she’s not gathering and gleaning great ministry ideas you can find her trying out new recipes or immersed in her latest Christian fiction pick.